According to a recent report by Transparency Market Research (TMR), the vendors of the global microwave oven market may witness remunerative opportunities for growth owing to the vigorous usage of technologically advanced and sophisticated home and kitchen appliances as per the improved standards of people all around the world. The vendor landscape of the global microwave oven market is highly competitive and all prominent players are developing key strategies in order to enlarge their business in other regions of the world as well. Some of the key players of the market are Electrolux AB, LG Electronics, Inc., Hoover Limited, Guangdong Galanz Enterprises Co. Ltd., and Sharp Corporation. Key market players can generate greater market revenue and give tough competition to each other by adopting Strategies like merger and applications and new product launches. These innovation and initiatives taken by major players are likely to increase the demand of the microwave oven market in the coming years. As per the TMR report, the global microwave oven market is assumed to reach US$25.0 bn by the end of 2022. The market is envisaged to expand with a CAGR of 5.8% within the forecast period of 2017 to 2022. The previous records of 2017 states that the market for microwave oven was worth US$18.9 bn and will show a remarkable growth rate in the years to come. The microwave oven market can be fuelled by factors like the rise in disposable income of people. With more income, there is a natural urge to upgrade the living conditions of people and there comes the need for a modular house and most of all a modular kitchen. This is especially taking place in the emerging nations of the world, hence the market in that area is expected to increase in demand as compared to market in other region. The prospects of growth could be favorable due to economic development and rising disposable income of people. Adding to that, microwave oven need may get a stronger support from increasing number of consumers who spend on their kitchen lavishly. The adoption of modular kitchen and home appliances are expected to increase the rate of growth in the global microwave oven market in the long run. From a geographical perspective, the market is seen to be dominated by the region of Latin America and Europe. The North American market has already gained maturity long back and have given way for the European nations to emerge. Rise in demand for microwaves can increase in countries like India and China of the Asia Pacific region because of the high salary inclination and desire for the best quality kitchen. Although the advancement in home and kitchen appliances may add fuel to the growth of the global market for microwave oven, factors like high electricity consumption may restrict the use of microwaves at homes. High electricity bills may be a cause of concern for families in developing economies and hence, it may hinder the growth of the overall market. However, various companies are expected to create and develop products that will consume less energy and thus, this may act as a solution to the traditional method of using electricity for using any devices. 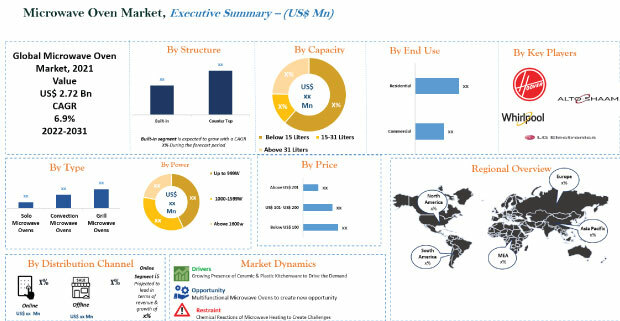 The information presented in the review is based on a TMR report titled, “Microwave Oven Market (Product - Grill Microwave Ovens, Convection Microwave Ovens, and Solo Microwave Ovens; End Use - Commercial and Household; Structure - Countertop and Built-in) - Global Industry Analysis, Size, Share, Growth, Trends and Forecast 2017 – 2022”.